Update 1.14 is coming tomorrow! Alongside lots of new options requested by players the latest DRIVECLUB™ update will add a free new Tour, Multiplayer Replays and one of the most exclusive cars in the world - the Ferrari LaFerrari. » Adds the Ferrari LaFerrari to your Garage! Complete Rank 5 of the "Ferrari Owners Club" Driver Accolade to earn access to this car for use in all areas of the game. » Adds the Startline Tour. All new players will now jump into a brand new Tour when they first play the game called Startline. » The Startline Tour is available for free and features 11 events and 45 objectives. This Tour mainly serve as a varied and well balanced introduction to DRIVECLUB and is based on some of the most popular and entertaining events from elsewhere in the game. » Adds Multiplayer Race Replays to the game. You can now save a Replay at the end of any Multiplayer Race and view it later from the Replays menu. » Adds a new Audio Settings option to change the acoustic settings for all cockpit cameras, so that you can change between internally recorded sound or externally recorded sound. » Adds a new Single Event option to set "Time Of Day" for a Single Event to half past every hour as well as on the hour. » Adds a new Single Event option to change the number of laps in a Race to any number from 1 to 25 laps. » Adds a new Controller Settings option to allow adjustment of the steering lock rotation angle on all supported steering wheels. » Includes general improvements to the game for better performance, stability and usability. » The Rimac Automobili Concept_One, coming to PlayStation®Store as a free download. » The Turbocharged Expansion Pack, coming to PlayStation®Store as a Season Pass add-on (and also available to buy separately). » The Turbocharged Car Pack includes: Ferrari F40, Chevrolet Camaro ZL1, Dodge Charger SRT8, Jaguar XKR-S Coupé and Volkswagen Design Vision GTI. » The Turbocharged Tour Pack includes 11 new Events and 5 new Trophies. » The Turbocharged Tour Pack includes a special bonus Livery, awarded when you collect 45/45 stars. » The Evolution Tour Pack, coming to PlayStation®Store as a Season Pass add-on (and also available to buy separately). » The Evolution Tour Pack includes 12 new Events and 5 new Trophies. » The Evolution Tour Pack includes a special bonus Livery, awarded when you collect 45/45 stars. » 2 new livery packs, coming to PlayStation®Store as a premium/Season Pass add-on. Each Livery Pack contains 5 new livery patterns to customise your cars with. 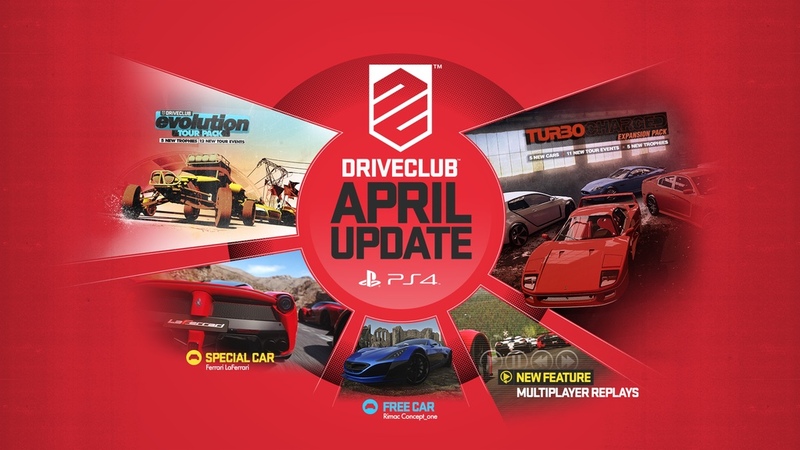 » More server upgrades: We are continuing to make the server changes required to improve online performance and enable the release of the PS+ Edition and the DRIVECLUB companion app. We will have more news on this soon. » Extra ranks and rewards are coming (beyond Level 55): We are planning to bring more on a monthly basis. » There's a new SHAREfactory™ Theme for DRIVECLUB which you can download for free from PlayStation®Store. It's out today in Europe and coming on Apr 23rd in Asia & Apr 27th in America. » More Game Updates! Please keep sharing your feedback about DRIVECLUB with us to help the game continue to evolve around you.